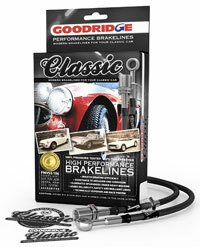 The brand new release from Goodridge, K300(Goodridge distributor) is pleased to offer the range of Goodridge Classic hoses made to give the retro look on classic cars. PTFE internal hose and the classic look of a rubber hose. The Classic kits are available with stainless steel fittings or plated mild steel fittings. The Classic range is aimed at all classic cars manufactured before 1980. If you don't see your car listed you can call us and we still may be able to help with hoses specifically manufactured for your vehicle. If your car is a show car in the vintage or classic range you may not want the more modern look of Goodridge's stainless braided hose but you may require a classic rubber hose look. Now you can have the best of both worlds, retro rubber look but with the advantages of the modern Goodridge hoses.